New Route Theatre has announced the fourth show of their 2012-13 season. 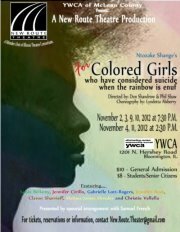 It's the Ntozake Shange classic for colored girls who have considered suicide/when the rainbow is enuf, described as "an affecting and poetic play that explores what it means to be an African-American woman." Look for performances of for colored girls from November 2 to 11, with Friday and Saturday curtains at 7:30 pm and the Sunday matinee at 3 pm. Shange's "choreopoem," focusing on seven women who "reveal themselves, their lives, loves, hardships, and ultimately their discovery of strength and love" was first performed in a bar outside Berkeley, California, but quickly moved to New York, with Off-Broadway and Broadway productions in 1976. After that, it was a book, a TV movie (with Alfre Woodard, someone I just talked about yesterday) and a film called simply For Colored Girls, directed by Tyler Perry and released in 2010. For New Route, artistic director Don Shandrow and Phil Shaw will co-direct, while Lyndetta Alsberry choreographs this movement-centric show. The seven faces of African-American womanhood will be portrayed by Leola Bellamy, Jennifer Cirillo, Melissa James-Shrader, Gabrielle Lott-Rogers, Jennifer Rusk, Claron Sharrieff and Christie Vallela. All performances will be held in the New Route Theatre tucked inside the YWCA of McLean County located on Hershey Road just north of Empire Street in Bloomington. You may reserve seats by sending an email to new.route.theatre@gmail.com. Please note that for colored girls replaces Sunset Limited on New Route's season schedule and will be considered part of the season pass for subscribers. For more information, visit the Facebook page for this event here.